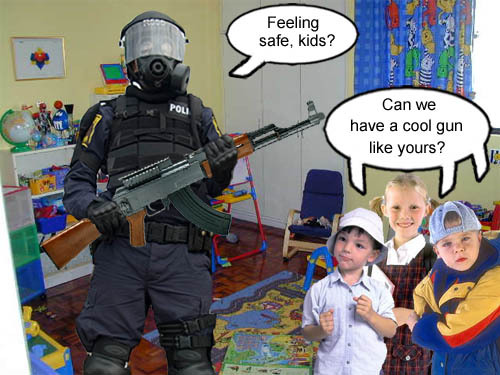 Armed Police In Schools: What Could Possibly Go Wrong? In the wake of the shootings last month in Newtown, the big debate now is whether or not to allow armed police in schools. Of course, the NRA and their bought and paid for Republican lackeys are all for this. In their view, the only way to truly be safe is if every single person in this country has at least one gun on their person at all times. Hell, even teach the younguns how to shoot as soon as they can walk. In other words, convert our civilization into a banana republic. Yes there is nothing more comforting and exciting for a child than seeing an armored police man holding an assault weapon while they play with their games and toys. Nothing bad could possibly come from that, right? The phrase ‘Violence begets violence’ keeps coming to mind. With the addition of armed police in schools, America’s rich tradition of gun lust is guaranteed to be handed down to future generations.